In 2011 Liverpool Biennial invited URBED to work collaboration with artist Jeanne van Heeswijk and local young people on a project in Anfield, Liverpool - then known as '2up 2down'. The project aim was to look at the issues facing the development of the neighbourhood, and explore how local people could take matters into their own hands. Taking its name from the vernacular description of the small terraced house, the project offers an imaginative, experimental to dealing with empty properties and spaces in Liverpool and beyond. From the outset the young people were encouraged to think about their future and their neighbourhood in tandem, while learning that if they work together as a community they can improve their surroundings and, with it, their life chances. We worked with a core group of young people to first develop designs for their ideal home, and then to take these ideas and apply them to the old 'Mitchell's Bakery' building on Oakfield Road in a fully participatory design process. We used plasticene modelling, full-scale modelling, collage and drawing to facilitate the communication of ideas. We then worked up designs to pre-planning stage, that were unforunately not able to go ahead at the time. Local residents also took a full part in the process, and in taking control of a development in their neighbourhood, and were supported to take over the bakery building. This is a local landmark, sitting on a promient corner almost immediately opposite Liverpool Football Club. A Community Land Trust was established by local residents, with the support of the Biennial - one of the first urban CLTs in the country. The project was re-named 'Homebaked', with the Community Land Trust and the new cooperative bakery sitting under this umbrella. This work also informed the 2012 Biennial artwork, the 'Anfield Home Tour', developed by Jeanne van Heeswijk in collaboration with Britt Jurgensen, Deborah Morgan, Graham Hicks and past and future residents of Anfield. The first building project for the CLT was the refurbishment of the bakery building to bring it back into use. We developed the designs for this space as a collaboration between the young people and the older local residents who'd become involved, and the building work was carried out in stages between 2013 and 2015. It is now the home of a thriving cooperatively owned community bakery, catering for local residents and match-day visitors. There have also always been ambitions to provide larger scale community owned and affordable housing, developed by Homebaked. 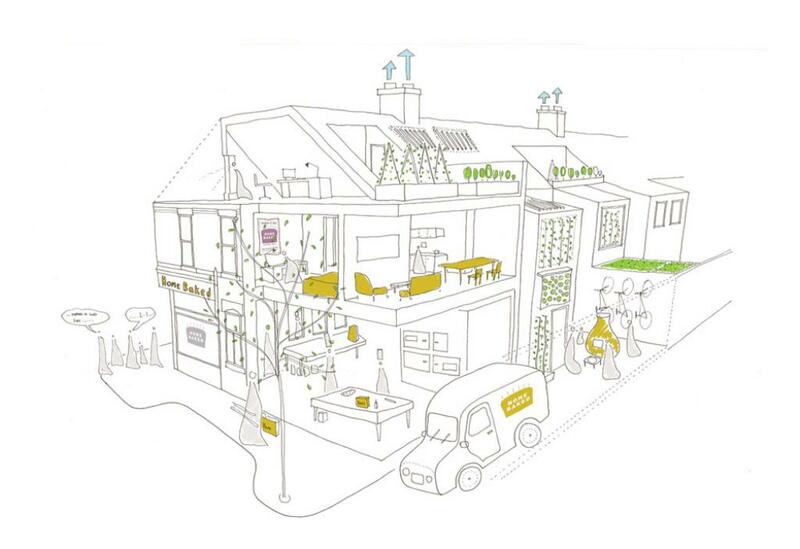 In 2015, Architectural Emporium were chosen by Homebaked in 2015 to work with them to develop plans for a new-build development on the remainder of the block, and Homebaked have continued to create interesting installations and events to bring together people in the neighbourhood and dream and plan for what comes next. We have continued to support Homebaked, through running workshops on development processes and briefing, and providing advice on energy and fuel poverty issues in design. We believe it is one of the best and most interesting community-led regeneration and refubishment projects in the country. Jeanne van Heeswijk and Britt Jurgensen have written an article summarising this project. URBED's Marianne explains her involvement at the start of this great video which gives a fantastic overview of the project. We're pleased to announce that, following a further fit-out in late summer 2013, the 'oven at the heart of Anfield' is up and running 6 days a week. 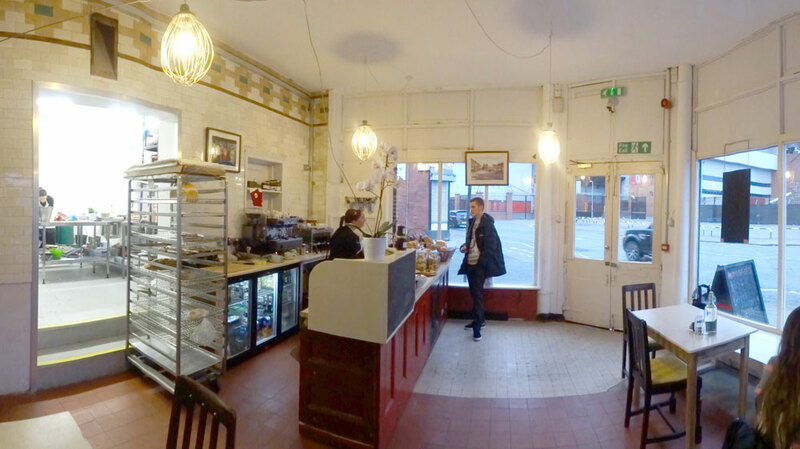 If you're in north Liverpool, pop in for a loaf or a coffee, Monday-Saturday. Plans are also in the making for further developments in 2014 - so keep in touch with what's going on via facebook or twitter. Following a lot of intensive work over the summer by all involved, the first phase of works at 199 Oakfield Road is now complete! This mini-fit out has given us the luxury of a space for meetings and workshops that the wind doesn't blow through (and even some plush new indoor loos). The works involved creating a new opening between the shop and the kitchen - so when the building is back in use as a bakery full time, customers can see where their bread has been baked. Whilst we've created a very modern looking new space for the bakery, we've also kept a lot of the features of the building that make it a bit special - like the old tiles (which it took some serious scraping to clean the paint from), and the unique whisk light-fittings. And of course the 'cakes for auspicious occasions' sign. Until the end of November, Homebaked will be open every Saturday from 11am to 3pm for a small 'taster' of what's to come - and so you can come and let the team know what you think they should be baking. It's also the finishing point for the 'Anfield Home Tour', part of the Liverpool Biennial festival. And though we've just finished the first phase, we're still focused on what comes next. Urbed enlisted the help of landscape architect/ cake decorator extraordinaire Claire Symons to create a fantastic model of the full scheme in icing - complete with roof terraces and solar panels. You can see this for yourself on the second floor of the Liverpool Museum, as it forms the 'a piece of cake' installation by Jeanne van Heeswijk for the Biennial. Here is our latest sketch of what the 2Up 2Down project hopes to create using two vacent houses and an empty bakery. We recently held a design camp to progress the design of the bakery and shop. This involved a brilliant presentation by Franny about her love of vintage design and reclaiming and restoring furniture from French markets! We then split into 3 working group: One for the bakery - this involved all the technical issues to do with ovens and working areas; Another group concentrated on the interior of the shop and how the layout would incorporate space for staff and customers; the last group worked on the exterior of the shop and the window display. There is a report which sums up the day's event which can be downloaded to the right. URBED has also recently completed a progress report for 2up 2down which details the design process, progress and decisions to date and sets out plans for the project. This can be downloaded to the right. There are some philosophical events coming up in the Home Baked bakery - check the Liverpool Biennial blog for more information. The design has really come along in the last month. We started making a large scale 1:20 physical model using cardboard we found in the rooms upstairs in the bakery. This has allowed the young people to develop their designs and help everyone involved visualise the design in 3D. The teams have also been using computer modelling to quickly make images of the rooms for each of the clients for the flats. With the designs moving forward fairly fast, we have created a few overview boards for people involved in the project to comment on. This was done through the workshop with the ABCC young people and at an Expert event where Debbie Clark, NW food adviser for Sustain and member of Unicorn Grocery Cooperative in Manchester came to speak about her experience working in a coop and also pointed out some great campaigns appropriate to the project. On 31st October Marianne talking to the young people about how their designs are translated into computer drawings. The young people made comments on the drawings about how they saw the design progressing and to show what we had drawn wrong. Then it was time for some apple-dunking and ghost stories - it was Halloween after all! On the 9th November there was an expert event about how to manage the Bakery business. Debbie presented how the Unicorn Grocery is run as a cooperative, and gave us some tips on some campaigns on making real bread. Other experts attended the session such as a bakery teacher from Liverpool Community College and a baker who used to work in the area. Walking round the full scale model houses Part 1 from 2Up 2Down on Vimeo. This week the young people made full scale models of terraced houses of their own designs. Building plans at full scale in cardboard helped the young people to refine their designs, since we could make changes easily as we went along (unlike when building in bricks and mortar!). It also helped to gain a greater understanding of scale, and how someone actually inhabits the spaces they had been designing. Whilst some imagination was needed to see beyond the cardboard, it was possible to set up a study room complete with desk and chair, a computer and family photographs or set a kitchen table ready for dinner. Walking around model houses part 2 from 2Up 2Down on Vimeo. It was just after this session that it was confirmed that the Bakery on Oakfield Road would be the site for the project - with specific plans to be developed by Christmas! Today was the official opening of the Bakery, this will now be a hub for the project with weekly workshops happening with the young people from ABCC youth group. Come along, meet the team and find out more about our plans for the bakery and 2Up 2Down in 2012. This video shows the first expert meeting which gives a comprehensive introduction to the project. Above: The Mitchells Bakery with comments from participants on the windows, making the project visible in the area. Over the past few weeks the young people have been making plasticine models of their designs. Untitled from jessica Doyle on Vimeo. In order to integrate the stages of work, as set out by RIBA with the consultation activities this project is founded on, we have come up with a corresponding workshop timetable. The groups of young people met with the the two clients to understand their needs. Bob's home is the last house left on a row of tinned up houses which dominate Anfield, Kealey is a youth worker at the BCC youth centre and currently lives in a flat on Anfield Road. The young people came up with questions and interviewed Bob and Kealey about what kind of home they would like. The young people discussed different images with Kealey to find which she preferred. A design for Kealy's perfect house. The students cam up with a series of questions to interview Bob with. The workshop at Saint Francis of Assisi today focussed on what the students would like to see happening as part of the project.